When a Peach Cobbler is more than just a simple Southern dessert. 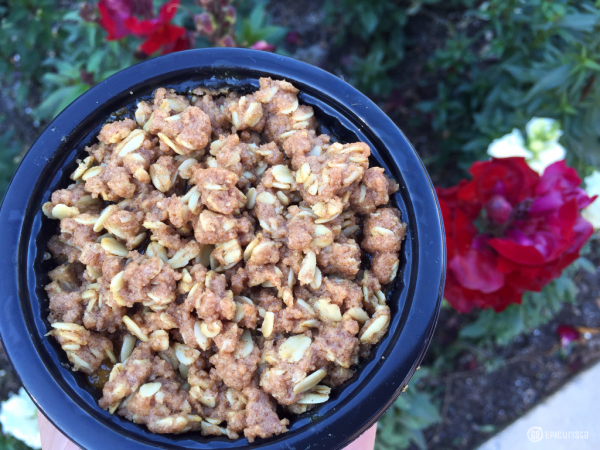 The warm and sweet center made of large chunks of baked peaches, surrounded by a delicious crisp of oats and honey, brings a touch of nostalgia with every bite. This peach cobbler has a rich history behind it. One you can enjoy on your next visit to Epcot in Orlando, Florida for true Southern comfort. 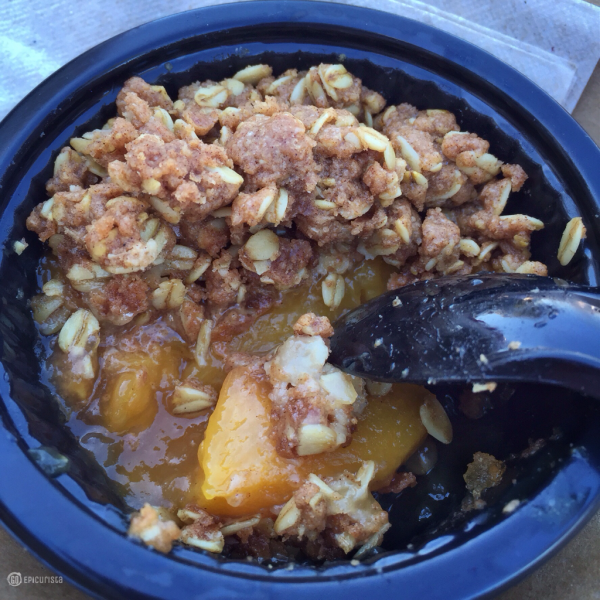 Mrs. Fisher’s Peach Cobbler at Epcot is pure Southern Comfort Food! So amazing! 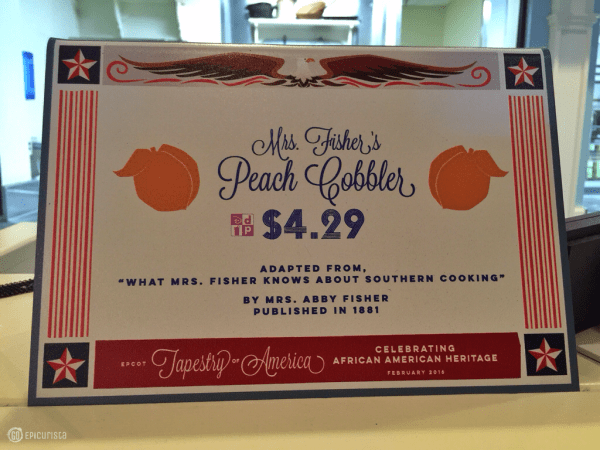 As part of “Epcot’s Tapestry of America: Celebrating African American Heritage”, Mrs. Abby Fisher’s original Peach Cobbler is being served at Liberty Inn at the American Adventure Pavilion, for a limited time. Why is this Peach Cobbler important? Mrs. Abby Fisher was one of the first African American authors to publish a cookbook dating back to 1881. This San Francisco chef, small business owner and former slave was unable to read or write so she dictated her recipes to friends who wanted to share her recipes with the world. “What Mrs. Fisher Knows About Southern Cooking,” includes 160 Southern-style recipes. It features her famous pickles, jellies and of course one of the most popular desserts, Mrs. Fisher’s Peach Cobbler. Who doesn’t love this traditional taste of the South? I would love to add this cookbook to my collection. 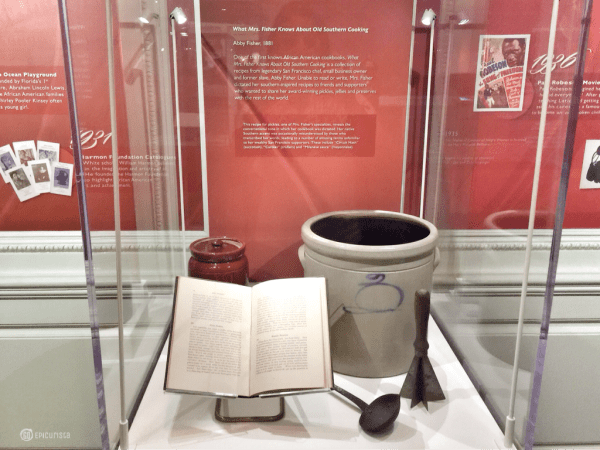 “What Mrs. Fisher Knows About Southern Cooking” cookbook is part of the Kinsey Collection exhibit on display inside Epcot’s American Adventure pavilion, now through 2018. The collection draws from an extensive assortment of rare art, documents, books and artifacts attributed to African American history. Philanthropists Bernard, Shirley and their son Khalil Kinsey share some of their vast personal collection of artifacts spanning 400 years of history. While many of us visit Epcot mostly to eat and drink around the world, the history found in the exhibits is truly worth taking the time to explore. 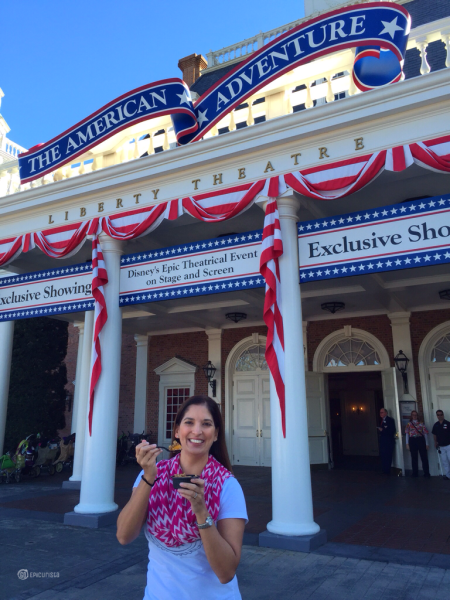 Plus, going inside the American Adventure pavilion is always a welcome escape from the Florida sun. 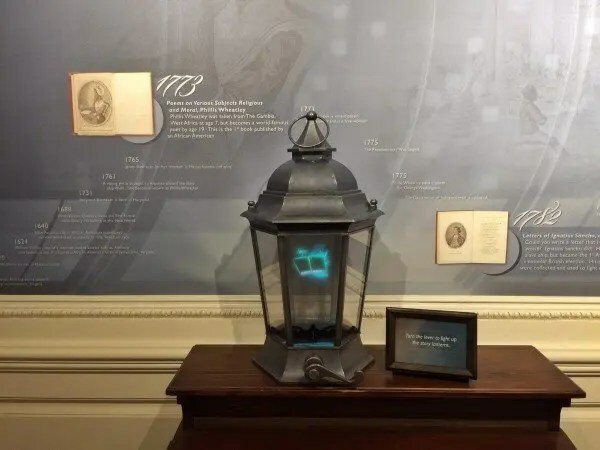 Touch screens and guest-activated lanterns with narration by Whoopi Goldberg, Diane Sawyer and other celebrities help bring the history to life. I loved the interactive nature of the exhibit. 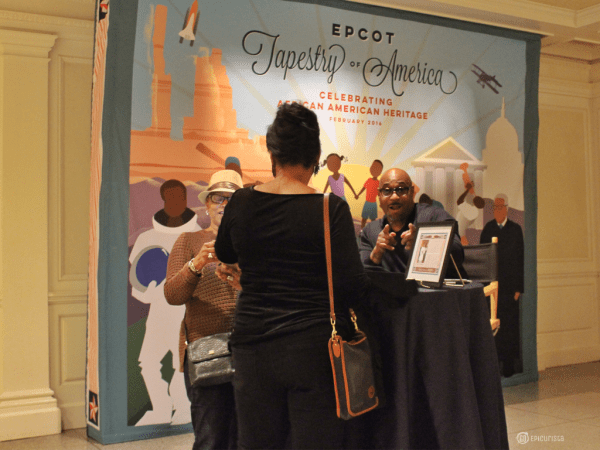 Guests can celebrate Black History Month throughout the month of February with special experiences at the American Adventure Pavilion at Epcot. From historical displays and intriguing artifacts to book signings by Celebrity Chef G. Garvin (“Turn Up The Heat”), best-selling author Terry McMillan (“Who Asked You?”, “Waiting to Exhale”), and music legend Patti LaBelle, guests can take a stroll through the pages of America’s history and learn about the influence of African-American culture. In honor of Black History Month, guests have the opportunity to meet renowned African-American authors and cultural icons, select Saturdays during the month of February. 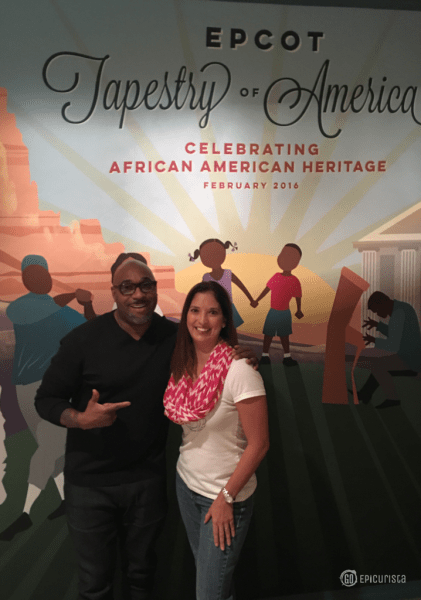 I enjoyed meeting Chef G. Garvin, author of “Turn Up The Heat With G. Garvin: More Than 200 Incredible Recipes from the Chef Who Keeps it Super Simple”. 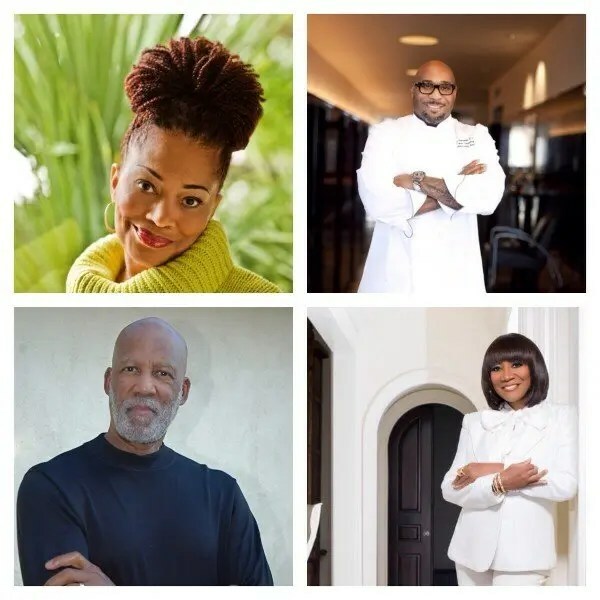 He’s not only an acclaimed chef and television host who has mastered the art of cooking, he’s also an award-winning writer having received an American Literacy Award and nomination for an NAACP Image Award. Most importantly, he is the kind of guy you want to hang out with. Larger than life personality and such a passion for food and travel. My kind of chef! His television show “Road Trip with G. Gavin” on The Cooking Channel has taken him around the country and he shared with me that he hopes to travel to far away destinations in Asia. As a bonus, I got a chance to add to my extensive cookbook collection, by having him autograph a copy of his book. I love his simple approach to cooking. We chatted about easy entertaining and his “go-to” cocktail and dish when entertaining friends, as well as what countries are on his “someday list”. Stay tuned for the details of this fun interview in an upcoming post. You will not want to miss his super-simple pork belly recipe paired with a to-die-for martini! 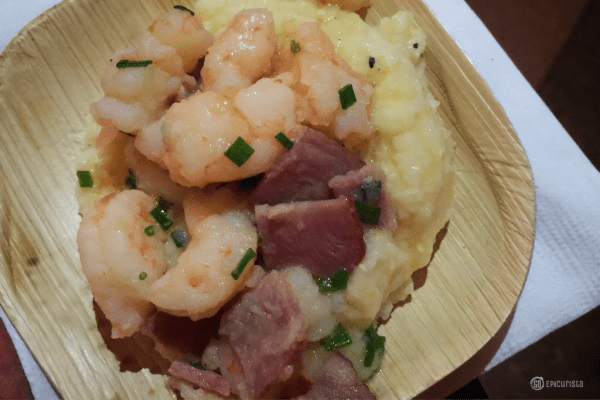 Epcot Chef’s were quite popular serving up the cheesy shrimp & grits. 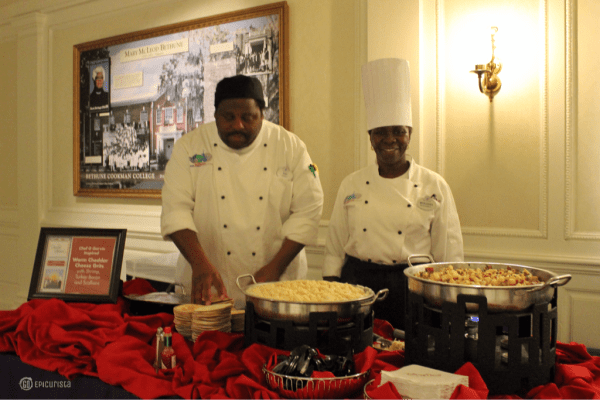 As a bonus, guests visiting for the book signing even got a chance to sample Chef G. Garvin’s Shrimp & Grits. It was perfectly creamy and rich with lots of flavor. He knows how to turn up the heat, for sure! Book signings are open to all guests and hosted at the American Adventure Pavilion, where books written by each guest author are also available for purchase. learned from that historic episode. 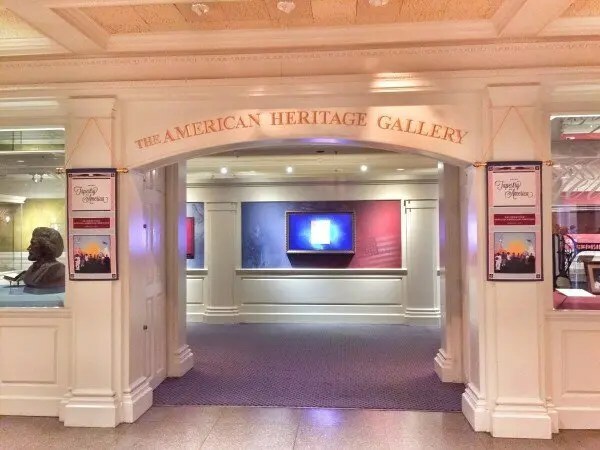 While inside the American Adventure pavilion, don’t miss walking around the rotunda and viewing the images of influential men and women who contributed to the progress of America. New portraits have been added to the collection for the month of February to further illustrate the contributions of many African American notables. The new displays feature African American figures such as Thurgood Marshall, the first African American U.S. Supreme Court Justice; Ronald Erwin McNair, the second African American to fly in space; and Bessie Coleman, the first African American woman to stage a public airplane flight in America. Don’t miss a performance by the amazing 8 person a cappella group, The Voices of Liberty. It’s a chance to escape the heat, sit and relax to the sounds of a simpler time, while they sing songs about America. The Ode to the 50 States, “Fifty Nifty United States” is a fun one! You get to cheer when your state is mentioned! I hope you will get a chance to GO! 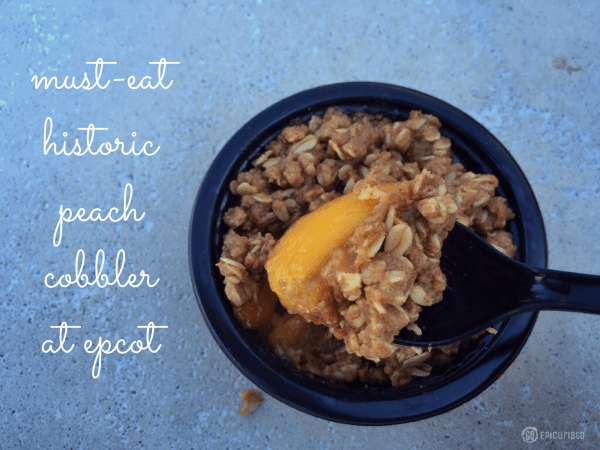 Visit Epcot at Walt Disney World Resort and enjoy Mrs. Fisher’s Peach Cobbler and all the wonderful exhibits that celebrate the Tapestry of America. Disclosure: I was an invited media guest of Walt Disney World Resort on this day. No other form of compensation was provided and all opinions shared are my own. As always, I only share with you great culinary and travel experiences worth celebrating. Hello, peach cobbler! I am going to get some of that the next time I’m there. Run! It’s only around for a limited time and trust me, it is so worth all the calories! It was fantastic!